It’s the experience, above all. Breathe in the majestic beauty from below. Have your breath taken away up top. From the thrilling views to the amazing stories, a visit to the Gateway Arch is an experience that never fails to inspire. Great monuments inspire you to explore new heights. Precious few take you there. The unique tram will lift you 630 feet up to the top of the tallest man-made monument in the United States. Gain a new perspective on this magnificent monument while cruising the Mighty Mississippi. With a variety of sightseeing, dinner, and specialty outings to choose from, a riverboat cruise is a fun and relaxing addition to your Gateway Arch experience. Stand in the footsteps of American heroes at this beautifully restored federal courthouse. The site of several pivotal cases, the Old Courthouse is where the enslaved Dred and Harriet Scott sued for their freedom and Virginia Minor fought for women’s right to vote. From stargazing workshops and yoga under the Arch to concerts, cruises, and holiday celebrations, there’s always something new to learn and do at the Gateway Arch. Work at the Arch and Riverboats! 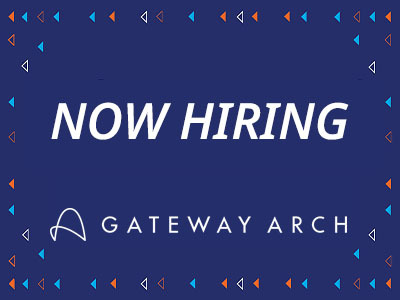 The Gateway Arch and Riverboats are now hiring for the upcoming seasons! Be apart of this exciting opportunity by joining the Arch team. 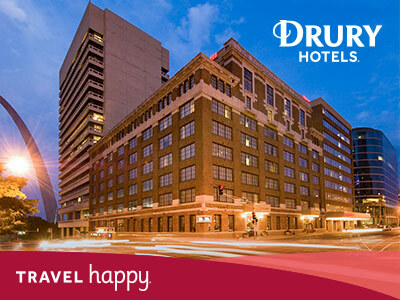 Travel Happy with Drury Hotels! 21 great Drury Hotel locations in St. Louis to choose from; enjoy Free Hot Breakfast, Free Wi-Fi, and Free 5:30 Kickback with hot food and cold beverages. Click below to reserve the Gateway Arch Package and receive a $26 credit at the Gateway Arch. A good night’s sleep is just the beginning!